011.15th October 2005. 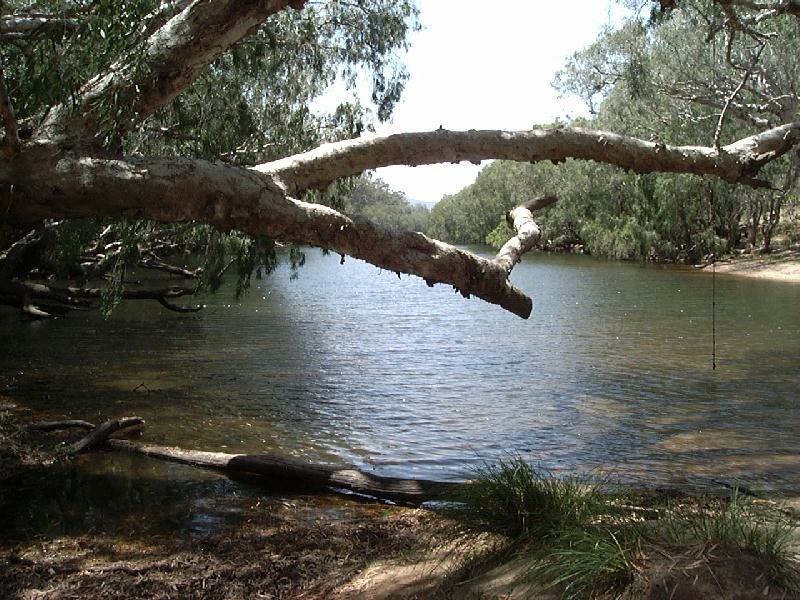 Now this is just one tranquil place… | Frank & Donnis Travel Blog "the more we see the more there is to see"
It is Wandoo Station. About 50 Klms west of Sarina, on private property of course. Not far from Sarina is the Range Road which is probably the least steep section of the Great Dividing Range for many Klms. At least it was reasonably easing driving in the MH. We zoomed past the turnoff but recognised the Sugarloafers sign as we did so. It was a case of coming to a stop, not easy to do with 4.5tonnes hurtling along at 100KPH, so there being no traffic, I backed up. Easier than driving to look for a place to do a U turn. A winding dirt track brought us to a railway line. A steep ramp went up over the line and down the other side. A gate was on either side, requiring the co-pilot to undo first one gate, move over to the other side and undo the other gate while I waited a reasonable time before driving up and over. Drive too soon and the gate on the other side might not be open and I could be stuck on the railway line. The huge coal trains, up to 2klms in length hurtle by 27 times a day, both ways. That means about every 30 minutes a train is passing. No way do we want to be caught up here. Of course once safely on the other side we have to go back and close the gates again. We commented this place better be good. It was better than expectations. A still flowing very wide Funnel Creek greeted us as we arrived and found the camp site up on the bank surrounded by massive river gums. Our Coaster at home among the gum trees. As always a dinner cooked in the fire and good company made for a relaxed Saturday Night. Those who arrived early on Thursday got the choice sites overlooking the creek. 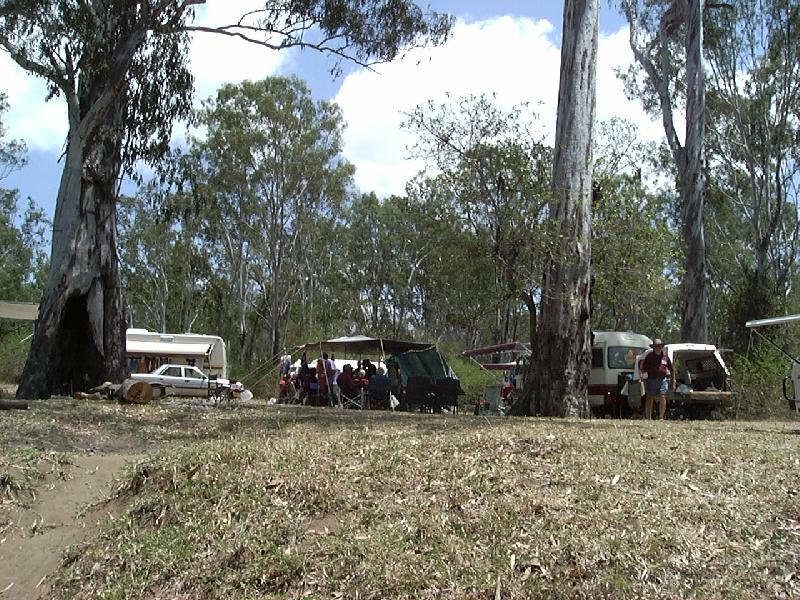 Main Campsite at Wandoo Station. We managed a site back in the stalls but still nice. Wandoo is a busy working cattle station. There are lots of waking tracks although probably more correctly they are cattle walking tracks who wander in the manner of cattle eveywhere but usually lead to water and take the easiest path up a hill or around an obstacle. 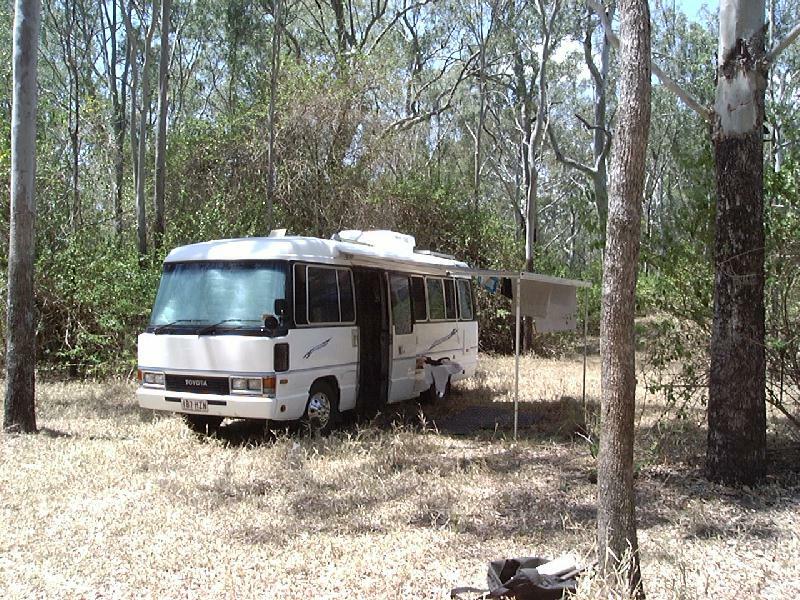 There are also many 4WD tracks for the owner to access various parts of the property. On saturday afternoon, Glen (a chapter member we met at the Dam Fine Rally) and I took a walk along one of the cattle tracks which followed the creek. We walked until the afternoon heat beat us and we turned back. All too soon Sunday morning tea, a Chapter Meeting, a bit of a chat, lunch time and then we had to pack up and face an almost 4 hour drive home.